Liam Neeson bravely stepped out in public last night, to attend Broadway’s tribute to his deceased wife, Natasha Richardson. At 8pm, crowds assembled as the New York theatres collectively dimmed their lights, in memory of the actress, who died on Wednesday night following a freak skiing accident. 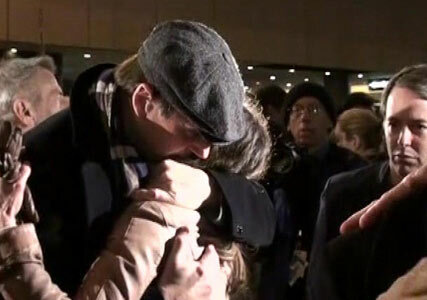 Neeson was joined by Richardson’s mother, Vanessa Redgrave, and was supported by a group of friends, including Sarah Jessica Parker (pictured embracing Neeson below) and Matthew Broderick, as he attended the tribute, just 24 hours after his wife’s life support machine was switched off. The event was particuarly poignant, as it was on Broadway that Neeson and Richardson first met in 1992, when they appeared together on the stage. An autopsy released yesterday confirmed that Miss Richardson had died as the result a ‘blunt injury to the head’, which caused bleeding on the brain. The mother-of-two fell during a private ski lesson in Canada on Monday, but initially laughed off the fall, and returned to her hotel. An hour later, she was taken to a local hospital after complaining of a headache. She was flown home to New York for her family to pay its last respects, but passed away late last night.